What we call trade axes today with the round/tear drop eyes and no polls were often simply called just 'hatchets' in the records of the fur traders and in the words of Indians. 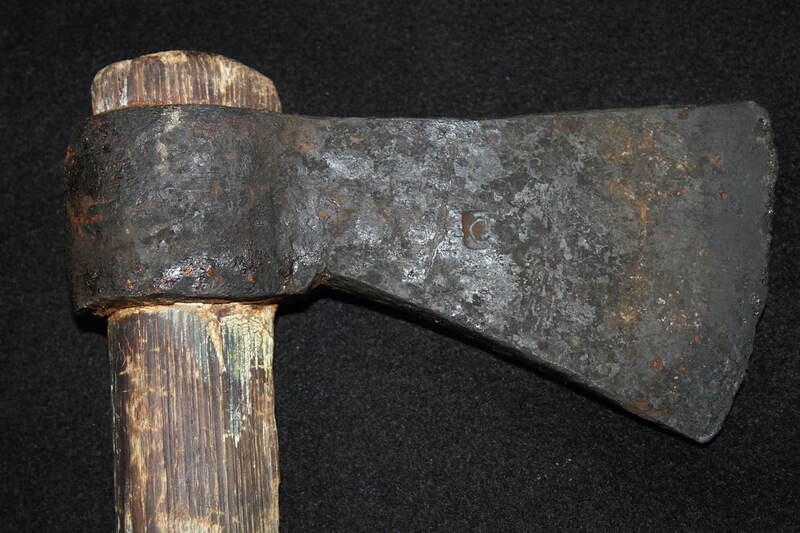 Other terms that have been used to describe this type of axe throughout the fur trade period were squaw axes, Indian axes, camp axes, axes, and tomahawks. We do know they were distributed from at least 1520 to about mid 19th C. although common axes of the period were occasionally traded to Indians. They came from Holland, France, England, and North America. Spain seems to have done very little trading if any in axes & they even outlawed their trade at one point. No trade axe specifically made for North American trade with Indians is known to have been made by Spain although some blacksmiths of Spanish origin did work in North America making trade axes for the Indians to a small extent. They were used primarily as tools but also as weapons if the need arose (spike tomahawks also were used as tools at times although their main purpose was as a weapon). Trade axes were referred to as tomahawks when they were used as weapons by writers of the time. Trade axes have been greatly maligned by the collectors of the much more expensive pipe tomahawks who claim they were never used as weapons although in the same breath the lighter trade axe of 1 lb. or less is clearly accepted as a weapon/tool by most. Any axe that could be carried like a belt axe was expected to do double duty as both weapon and tool as the need arose. Is it the same as a tomahawk? That depends on your definition, but definitions have been changing through out the historical period and still are. Certainly Indian women did use these to chop wood but just as certainly men (Indian or white) used them as weapons too. 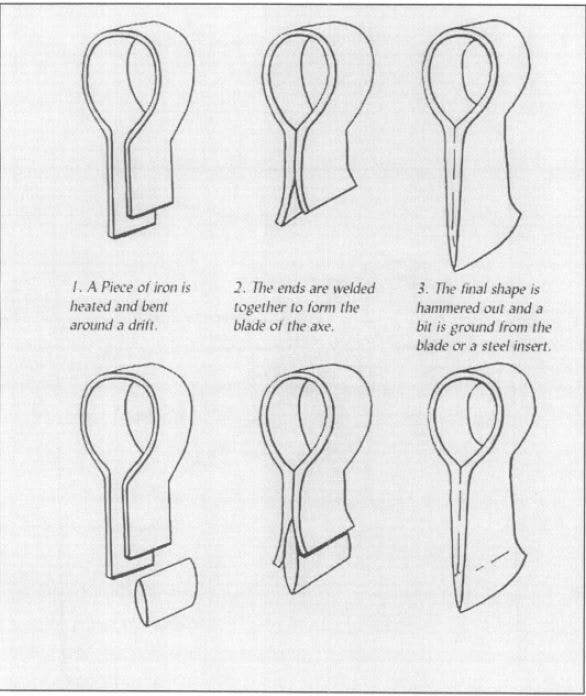 Trade axes were designed to be cheaply made, easy to transport without handles and easily fitted to a sapling haft, usually in 1 lb., 2 lb. or 3 lb. sizes although some have been recorded as much as 6 or 8 lbs in early French trading. 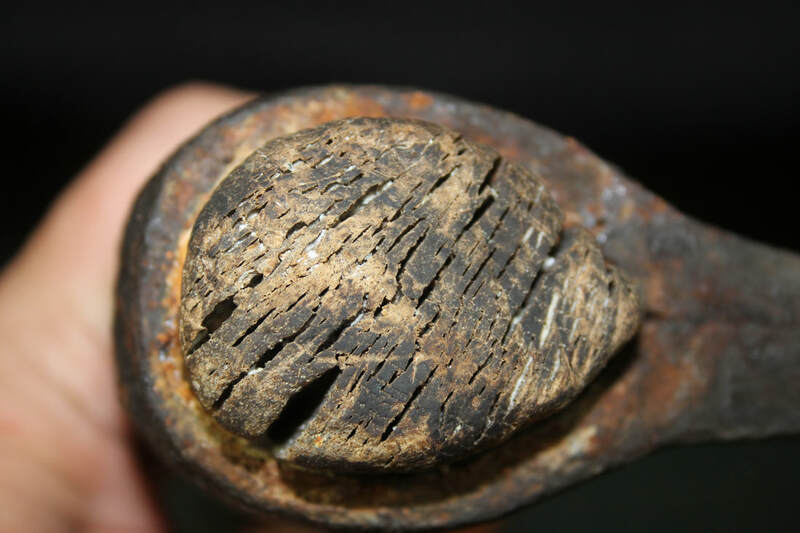 Some hafts were shaped in more of a tapered tear drop cross section to fit the eye more perfectly, probably by whites who had more access to tools. In trading records these were simply referred to as 'hatchets' or " axes" by the tribes and white men of the fur trade. 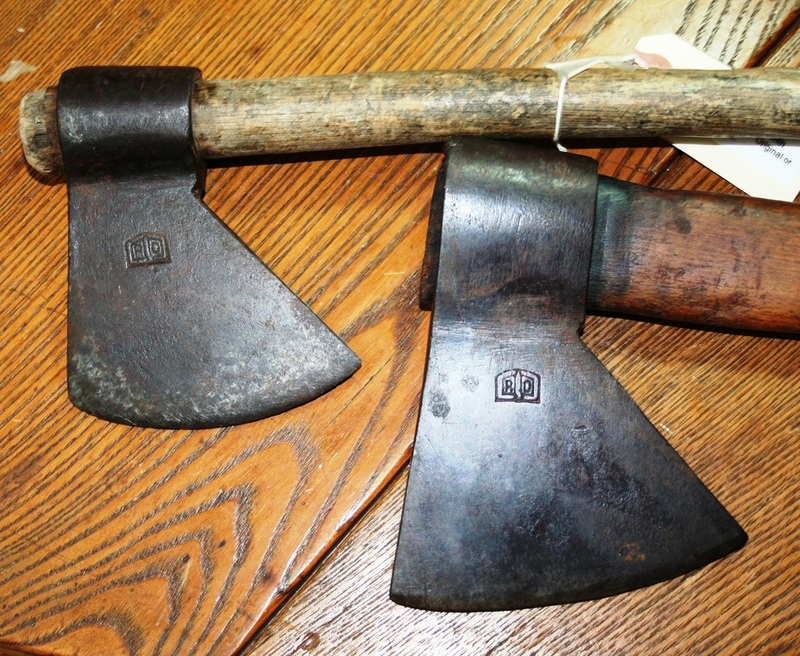 They were rarely referred to as "trade axes" during the period of use but only called that later by collectors. Often historians will look at the ledgers of traders to determine what terms were used (which varied from place to place) but what a particular tribe or individual called something might be different than what the ledgers indicate are ordered from Europe where another culture is reading it. To sum it up the terminology is clumsy, imprecise, misleading at times & not entirely agreed upon by all. From the "Invoice of Sundry Merchandise from the Rocky Mountain Outfit" 1836 under the charge of Fontenelle, Fitzpatrick, & Co. there were listed "50 Round Head Tomahawks" among other axe types. So in this case the round eyed trade axes were then termed as "tomahawks". So if they called them tomahawks then what is the problem with us calling them that today? 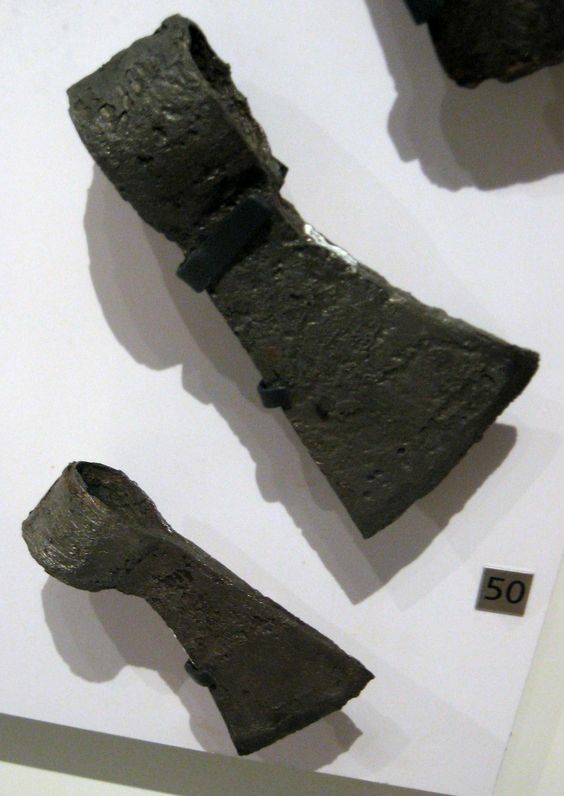 The fact that these trade axes were designed primarily as tools (especially with the heavier versions) is not disputed. But the fact that some were called and used as tomahawks/weapons is also true based on the evidence. (See Page 26). We may never know the details of what all was used in fighting & certainly to the collector that is the great attraction to the drama. We know for a fact that some pipe tomahawks were used ONLY as symbolic tools & never as weapons. We may never know the details of what all was used in fighting and certainly to the collector that is the great attraction to the drama. Yet if you were to tell a pipe tomahawk collector his prized possession was a tool you might be removing it from your forehead! The romanticized notion of a weapon being far more important than a tool is a better topic for a psychiatric symposium. Ego plays a huge roll in the terminology of today & their collectability. The term 'squaw' axe was used sometimes to refer to a common trade axe as a native American women's camp tool for chopping fire wood in ledger books and in conversation of the time. Firewood was usually a women's occupation. Once I made the mistake of calling a trade axe a 'squaw' axe to a person over the internet not realizing he was a Nez Perce tribal member and was quickly informed that was 'fightn' words' where he came from. Of course that makes sense & I should have thought first but he seemed to understand it was unintentional. Some words while appropriate during the 18th-19thC might no longer be appropriate now--just as in the white man's culture! 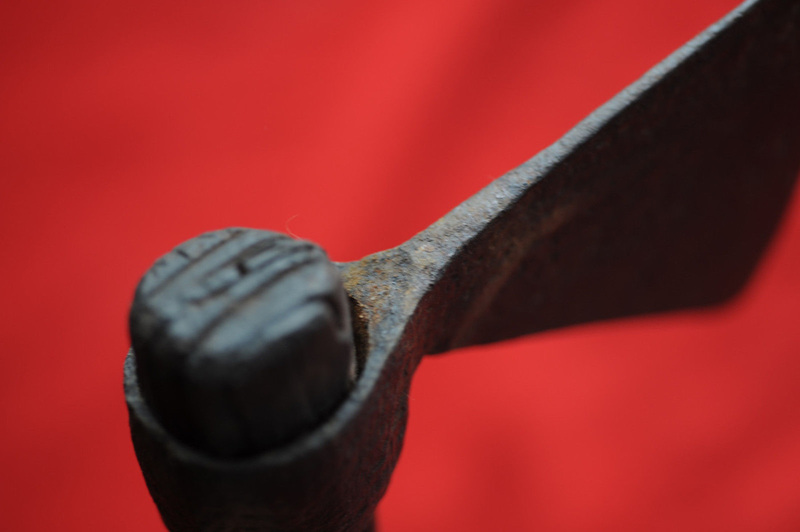 Most collectors just call these trade axes today & nobody seems to have a problem with that. 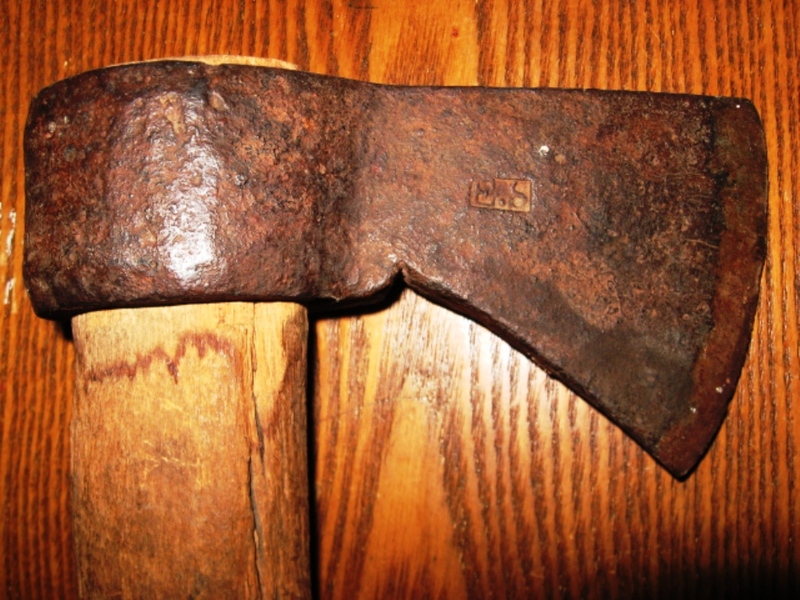 The term 'camp axe' was used in some trading records but more often it was simply called a hatchet. 'Camp' axe tends to include ANY axe that was used in camp during the frontier days & not necessarily those traded to Indians and mountain men exclusively, so as an identifying term it is useless. 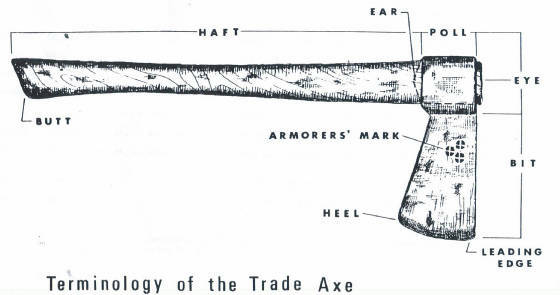 If you stuck it out so far to read all that & you are still wondering what a trade axe is...I don't blame you. These were cheaply made with just a strap of iron U-shaped & wrapped around a blacksmith's mandrel or drift and then sandwiched together with borax as a flux to weld it-- sometimes with a steeled edge added or not. Their eyes were tapered so a sapling with its widening diameter could be slid through to the end and would not fly off when swung in an arc (an attribute that modern axe makers would be wise to continue). Indians, mountain men, explorers, hunters, etc. would use ANY axe that fit their purposes. A light weight axe was a multipurpose tool AND weapon so it would save them weight in carrying. Remember there are many tribes which were nomadic and the fewer the accessories to carry, the better. So here are some guidelines for identifying those that were primarily traded to Indians which is something you'll never find published anywhere else. they were cheaply made, (see Lewis & Clark Journals). -weight averages between 1 to 3 lbs. -if there is a blacksmith's mark present are the edges crisp and sharply made as if done recently or is it worn smooth? In general whites seemed to prefer the flat polled axes for hammering whereas Indians most often used the round polled with the exception being the HBC square polled axe. 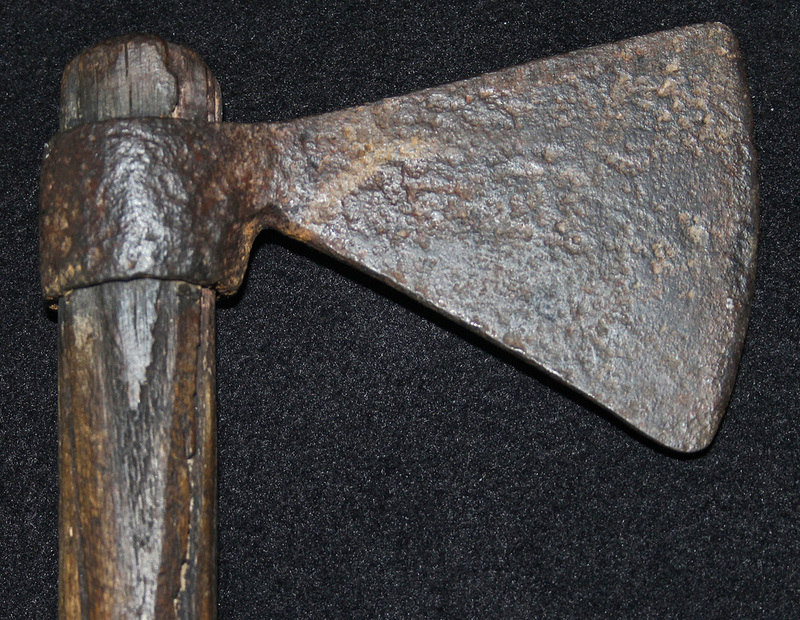 The typical Hudson's Bay Company axe had a thin square poll. Many round eyed trade axes are flattened from using as a hammer later on but they were not originally flat in the back. That may not be so much a preference for round eyed as just all they could get from trading posts but we simply do not know. 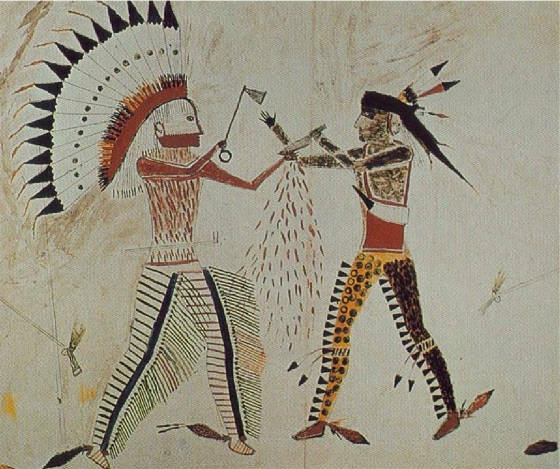 In the later times of the 1840s-70s half-hatchets became preferred by some Western tribes as trade goods or annuity gifts. 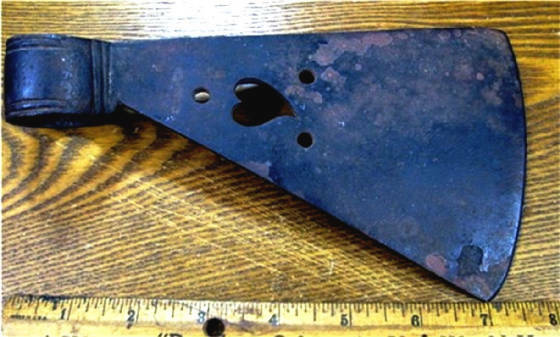 British made trade axes tend to have notches extending ~0.46" or more on average while French ones tend to have notches about 0.25" (this is measuring from the inside point of the eye where it comes together to the incised V point of the notch). Naturally this measurement can be misread if the eye has been opened up slightly from hammering--a common trait. How did they carry these? 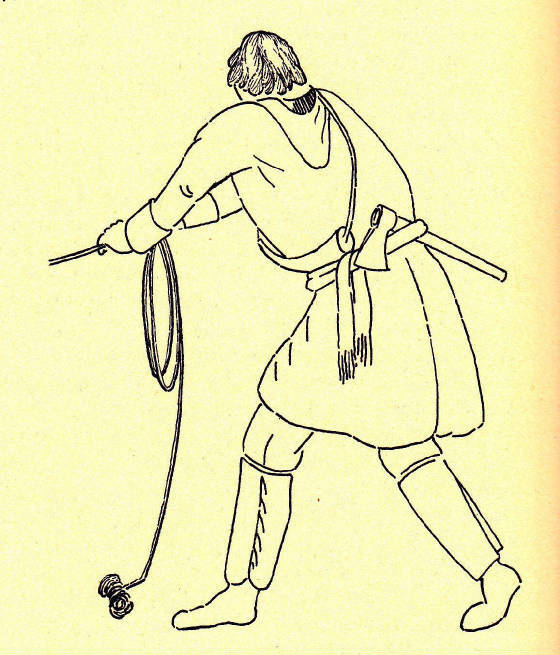 Here is one sketch below that was made by A.H. Murray in 1847 of his assistant Manuel in the Porcupine-Yukon area where Murray says it shows 'a sash in which he [Manuel] carried a small Hudson's Bay axe'. (from The Beaver, 6/1947, "Founding Fort Yukon" by Clifford Wilson.) Notice the axe is carried on the back & not on the side. Perhaps noteworthy is it is of the common trade axe variety and not a spike tomahawk. Excavated French trade axes in Royal Ontario Museum--1730-1760. These are not considered a trade axe however since they are constructed so similarly I have included it here. Plus I didn't feel like adding another page. ;) Many who own them would be perhaps upset it is included among the lowly trade axes since these were weapons only & thus much more valuable. Well, I understand. They are much thinner than trade axes & used only as weapons so many collectors are quick to disparage any similarity to trade axes, yet they both have round eyes and a single plain blade. 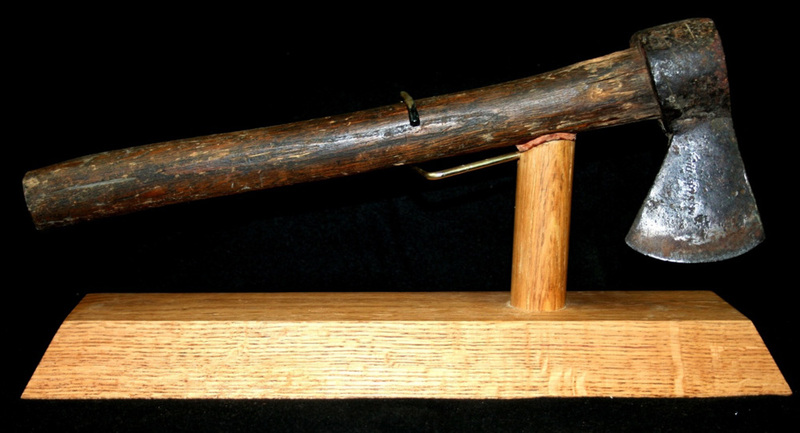 Since trade axes were around long before Missouri War Axes I consider them a weaponized version of a trade axe but many would be insulted at the comparison. Some of the last Missouri War Axes sold were the cast iron Dunlop & Florer trading post ones from the 1860's-1870s by which time the Osages & other Missouri River tribes were on reservations & using them as dance items. While they are an interesting piece of history they were probably never used as actual weapons & perhaps among the first borderline 'tourist' items. Below here is shown a rather gruesome battle scene between a Mandan chief Four Bears (MATO-TOPE) & a Cheyenne. Note a Missouri War Axe used by Four Bears versus the knife. Although Four Bears was badly injured in the fight he was the victor and painted this in 1834. Missouri War Axes before the Dunlop & Florer era were only used as weapons -- they never had steeled edges. Collectors tend to put this in a separate category all by themselves. The Missouri war axe shown here was made about 1820 to 1850. Typically they have round eyes (which became wider as time progressed), triangular blades (not the flat on top profile), very thin in cross section (~3/16"). This one is marked by the blacksmith but illegible except that it is ending in the letter F. It measures 4.5" wide x 7.875" long & weighs 14.7 ounces. The eye is 1.15" in diameter (medium). The surface has been burned in a fire. 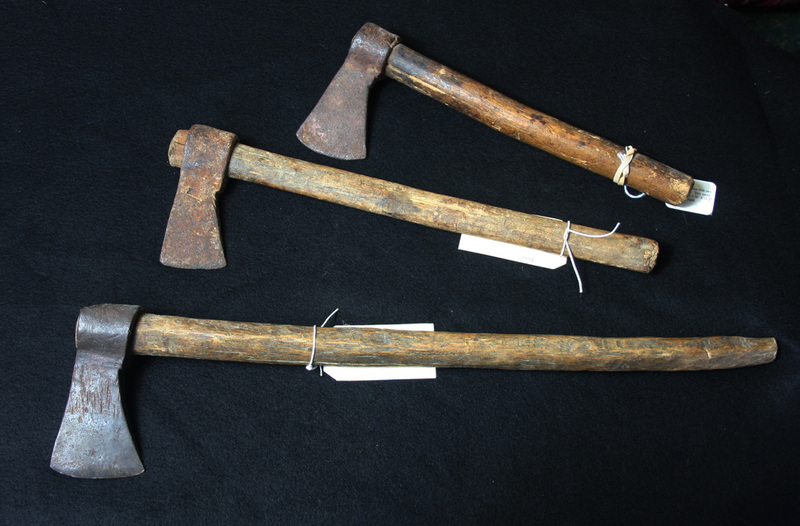 Lewis & Clark referred to these as 'war axes' or 'battle axes' but the term Missouri War Axe was used by authors to indicate their only area of use in the West. They were used by a number of different tribes in the Missouri river watershed region including the Sioux, Shoshones, Mandan & Osage, often on horseback. They were already in abundance among the local tribes by 1804 when Lewis & Clark had started their journey. Here is a very early ca. 1780's Missouri War Axe with a period ash haft and a small blade. 20.5" long. This is the darkest natural patina on ash I have seen & the pitting on the head indicates many years of exposure to the elements. This was purchased from New Mexico but likely did not originate from there & was traded from tribes far North of there. 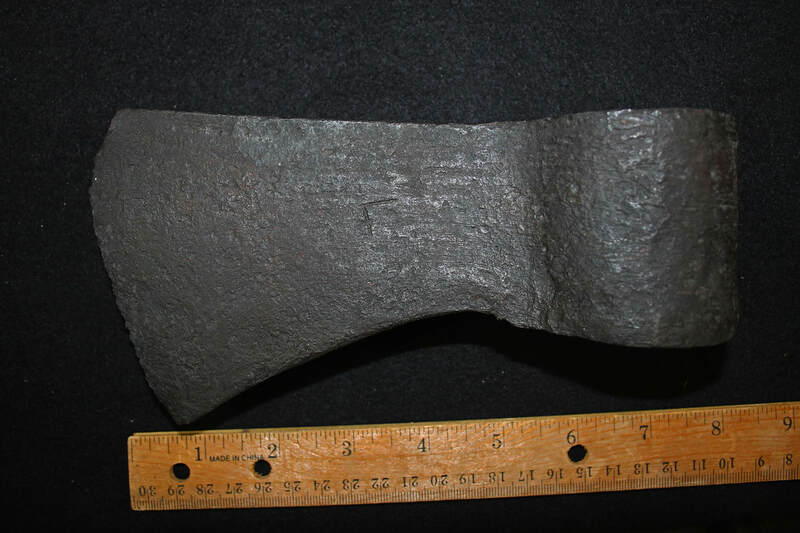 This trade axe has the mark of Miles Standish (1793-1868) who was a blacksmith for the Indian trade & 6 generations removed from his famous forefather Captain Myles Standish who was the leader of the Plymouth Rock settlement. Some rare trade axes & traps of his still exist with the name "M.STANDISH". Another type shows the mark "M. STANDISH/ N. YORK" on the blade. 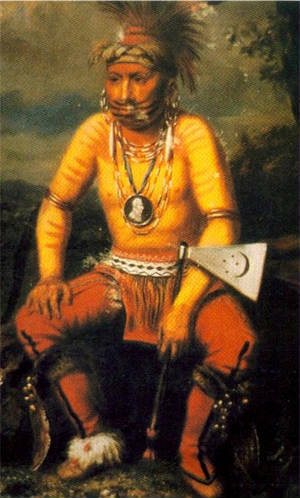 Standish worked at Fort Michilimackinac from until ~1823 and then in Montreal from 1823-1828 and then worked in New York City for the American Fur Co. from 1828 until his death in 1868. He was listed in census & directories as an edged tool maker from 1835 on in NYC, Ward 9, District 2. He is known to have supplied lighter weight trade axes, tomahawks & traps to various fur trading companies but primarily the American fur Company. 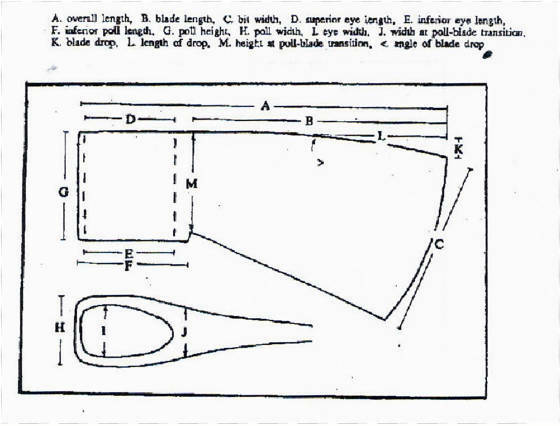 On December 16, 1836 the Pierre Chouteau Jr. & Company of St. Louis ordered the following from Miles Standish: 400 American ½ axes Kentucky pattern to weigh 1 ½ lb. each; 10 dozen Cast Steel axes 2 lb. each; 5 dozen Cast Steel axes 1 ¾ lb. each; 5 dozen Cast Steel axes 1 ½ lb. each. This particular axe is 5.25" x 3" x 15.5" overall length & weighs 1 lb. 13.5 oz total with an original period birch haft. It came from a Northern Michigan collection. These trade axes which can be traced to known blacksmiths in the fur trade number in the single digits & are extremely rare to find. Miles Standish was born 6/18/1793 in Middleborough, Plymouth County, MA. and died Oct, 1868 in NYC, NY. He also had a son named Miles. Miles b . 1793 > Moses b.1763 > Moses b. 1733 > Lt. Moses b. 1701 > Ebenezer b. 1669 > Alexander b. 1627 > Captain Myles Standish 1584. 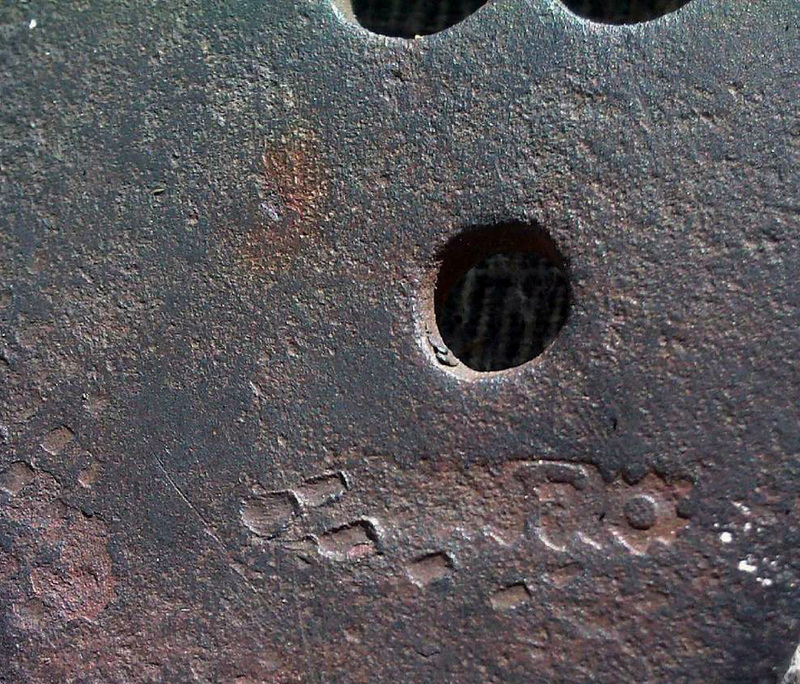 This ES blacksmith's mark was also found on an old branding iron found at York Factory, Hudson's Bay Company. It is extremely rare to find a known blacksmith's mark on an tomahawk. This is likely the mark of Edward Smith who was the longest serving blacksmith employee at York Factory from 1829-1846 and a branding iron bearing this "E.S" trademark on the handle shank was found at York Factory. 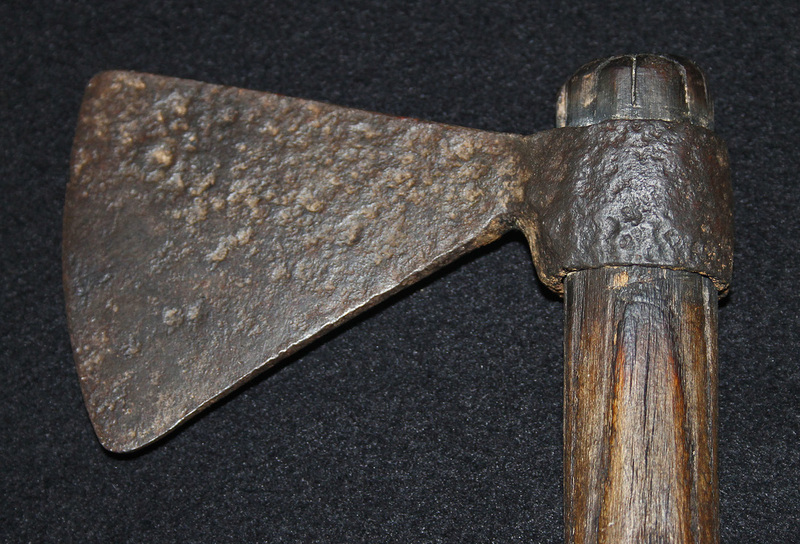 This is a very unusual example of an early trade axe. It was found by a scuba diver metal detecting in the cold, deep water under about 5" of sediment where the bacteria level is very low near a 1760's British site near the St. Lawrence, Montreal. Completely intact with its 29.5" haft it is the longest haft I've ever encountered on a trade axe, it was preserved in a bath solution for 10 months. 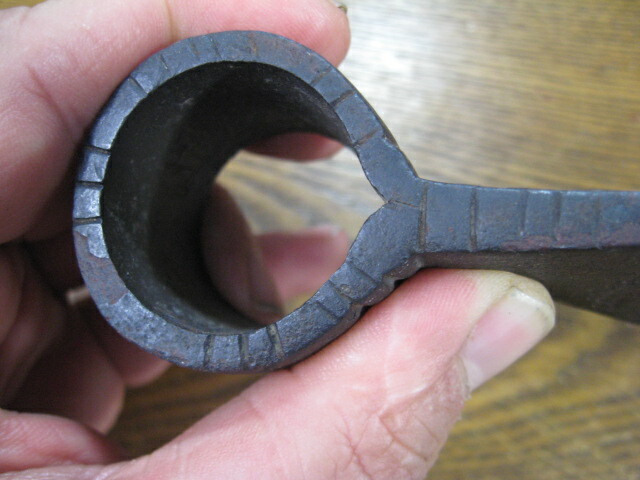 The head is blacksmith marked with a letter "D" upside down. This is the 2nd example of this mark I have seen. The oak/ash haft was shaped with draw knife/spokeshave with a eye drop cross section & slightly swelled end grip. The finely shaped haft indicates to me that it was likely used by someone with more access to tools than local Indians, meaning whites. The extra long haft indicates it was intended primarily for felling trees even though the head is medium sized. 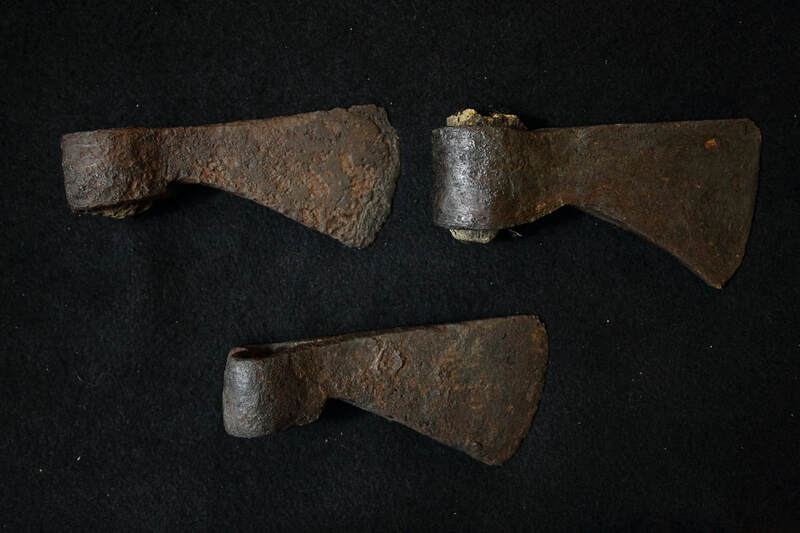 Several more smaller belt size trade axes, with portions of hafts in two, found in the same Quebec 1760's area as the above example underwater. 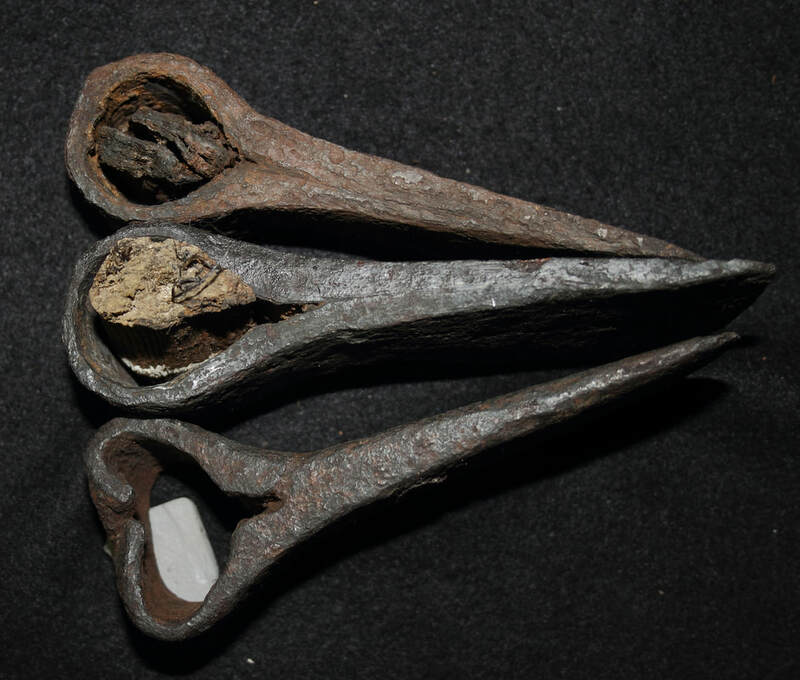 The center one has a tear dropped fitted haft (now heavily shrunken with age) similar to the long haft trade axe above. Another underwater find in Quebec. 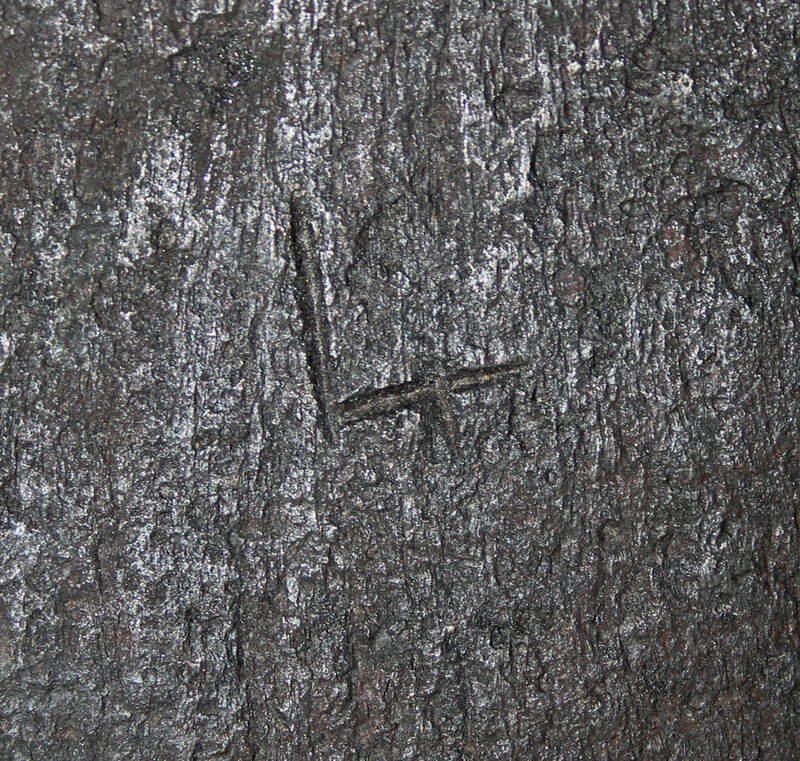 The mark appears to be a hand chiseled letter "L" with a little cross made out one arm--or a "4". 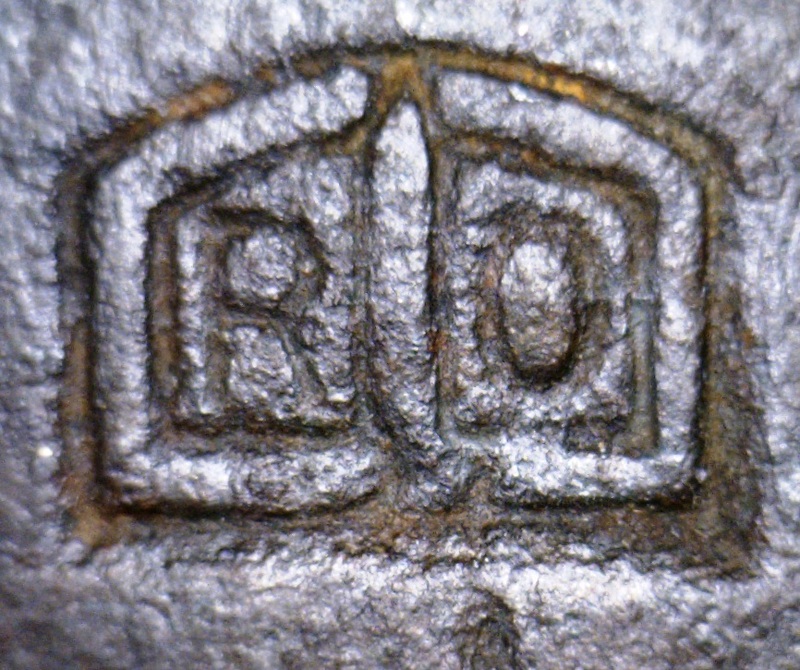 The RO mark on these trade axes has been dubbed the "tombstone" mark by collectors for obvious reasons. These wide bladed axes from Spain with round eyes are often mistaken as trade axes & are now pictured in books as such. Unfortunately Spain never traded axes to North America & these have been cheaply imported since after WWII here to be resold as more valuable trade axes. The thinner blade is wide with an angle of 145+ degrees instead of the usual 135 degrees or less; the eye is either round or oblong but always tapered; the iron stock is very thin (less than 3/16"); some are marked with this tombstone mark & some are not; averages 4.5"long x 4.5" wide. This style with the wide blade and oval eye is identical to ones found in Spain however no documentation exists of axes being made in Spain and exported here during the frontier period. None have ever been recorded on N. American sites. Concerning the tombstone RO mark I have found quite a few of these old axes currently being sold in Spain. In short... they were never used here. I recently discovered another one of these for sale in Spain & the seller indicated the blacksmith's name for this mark was Ramon Onraitra. Just one of many cheap axes being used to deceive collectors. "When you rise in the morning, give thanks for the light, for your life, for your strength. Give thanks for your food and for the joy of living. If you see no reason to give thanks, the fault lies in yourself. "